The Dreidoppel basic baking ingredients save you a lot of work. The variety of applications and the easy handling will also convince you. With Eisan we provide you with a possibility to make meringues quickly, our Top-Fondant can be processed directly from the bucket and Bienetta helps you to make delicious florentines or the topping for bee-sting cakes. A savoury quiche or a delicious vegetable tart – our basic flan mix Gourmet Eierguss is the ideal partner here. 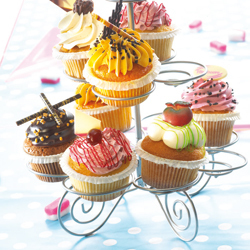 Muffins Premium – and there are no limits to the variety! Muffins Premium is a basic mix which was developed especially to make dough for pound and sponge cakes. Moist sheet cakes, fresh sponge cakes or muffins with their typical form are only some of the different applications. Ask for the great recipe ideas using Muffins Premium – whether cupcakes, Picco or classic cakes – here you are sure to find your new favourite recipe. A good basis is a guarantee for all delicious cakes and pastries! Just click to take a look for heavenly Florentines and more! 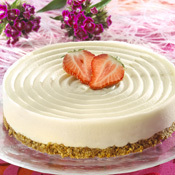 Just click to have a look for our CHEESECAKE MIX application!